Please click here to read our shipping information before ordering anything from this web site. 3" Golden yellow mop heads hang off each bloom spike. Plant grows great and makes a spectacular specimen plant. BS Mounted on Tree Fern Totems. This is one of the really showy ones. Elegant heads of silvery white tendrils cascade from the flower stem. A bright yellow hinged lip gives a splash of color. Also very showy is the spotted form of medusae. This one has the same silvery tendrils but they are adorned with fine red spots. 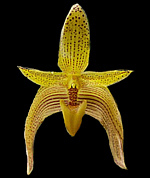 This species has very heavy substance 4" gold flower with fine maroon stripes on the sepals, petals and lip. Has a hinged lip that rocks in the breeze. This species is from Bangladesh, Thailand, Malaya and the Andaman Islands. It's foxtail of lilac colored flowers smell sweetly of lilac. One of the ones that don't smell bad. 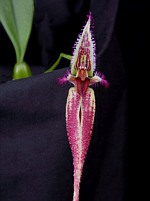 This is an easy to grow hybrid made by our friend Bill Thoms and named after his wife Doris. Flowers are very intricate with deep wine red tassles adorning the dorsal sepal and petals. It's deep red lip is hinged and rocks when touched. This species grows quickly and blooms freely. 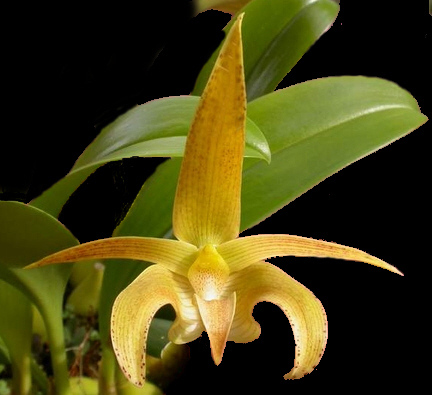 It is native to India, Borneo, the Philippines, Thailand, Laos, Malaya and Vietnam. This is another great Bill Thoms hybrid. Spots on the dorsal and petals and stripes on the lateral sepals. A red hinged lip that rocks when touched gives it even more charm. Seed grown plants will vary from photo although the photo is a good representative of the cross. 1" tawny orange umbrells are well held on flower stems from beneath the flower like an umbrella. Plants are grown on tree fern totems which display the flowers very well. 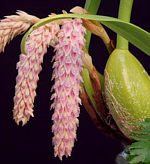 The photos we use here are not from the plants we have for sale, but they are almost identical.